This beautiful home sits on a corner lot and it was remodeled in 2018. The kitchen features granite counters, soft close cabinets, stainless steel appliances, recessed and pendant lighting as well as two breakfast bars. The large master bedroom has a slider leading to the screened porch and fenced back yard. The master bath was remodeled with dual vanity, toilet, lighting, tile and walk-in shower. The second bath was also updated with a dual vanity, tile, lighting and toilet. The A/C was installed in 2018, tile roof in 2001 and updated double pane windows. All of the flooring was replaced as part of the remodel with wood like porcelain tile in the kitchen, living areas and bathrooms with carpet in the bedrooms. There are two large living areas with one having a wood burning fireplace and this is a split floor plan making for a very nice layout. New front door, six panel interior doors, baseboards and ceiling fans throughout. Freshly painted inside and out. Oversized two car garage which is great for extra storage. 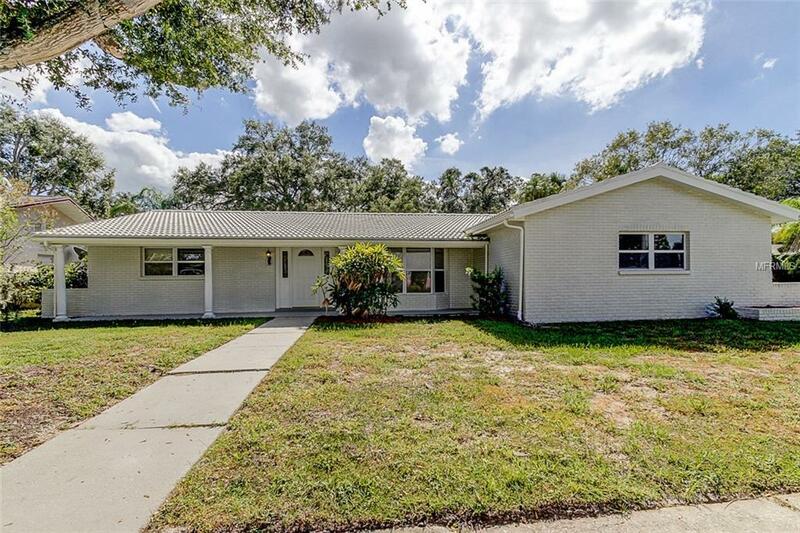 This home is zoned for highly rated Highland Lake Elementary, Palm Harbor Middle School and Palm Harbor University High School. Convenient to schools, shopping and restaurants.